Selecting which assumptions to include in your model is a crucial part of model design. Incorrect assumptions will lead to models that give inaccurate predictions, due to these faulty assumptions. However, it is impossible to build a model without making at least some assumptions. As you have seen in Chapter 1, in this book we will use factor graphs to represent our models. As you progress through the book, you will learn how to construct the factor graph that encodes a chosen set of assumptions. Similarly, you will learn to look at a factor graph and work out which assumptions it represents. You can think of a factor graph as being a precise mathematical representation of a set of assumptions. For example, in Chapter 1 we built up a factor graph that represented a precise set of assumptions about a murder mystery. For this application, we need to make assumptions about the process of a candidate answering some test questions if they have a particular skill set. This will define the relationship between a candidate’s underlying skills and their test answers, which we can then invert to infer their skills from the test answers. When designing a factor graph, we start by choosing which variables we want to have in the graph. At the very least, the graph must contain variables representing the data we actually have (whether the candidate got each question right) and any variables that we want to learn about (the skills). As we shall see, it is often useful to introduce other, intermediate, variables. 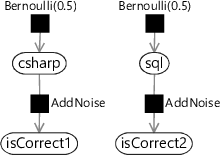 Having chosen the variables, we can start adding factors to our graph to encode how these variables affect each other in the question-answering process. It is usually helpful to start with the variables we want to learn about (the skills) and work through the process to finish with the variables that we can actually measure (whether the candidate got the questions right). A candidate has either mastered each skill or not. Assumption 1 means that we can represent a candidate’s skill as a binary (true/false) variable, which is true if the candidate has mastered the skill and false if they haven’t. Variables which can take one of a fixed set of values (like all the variables we have seen so far) are called discrete variables. Later in the chapter, we will encounter continuous variables which can take any value in a continuous range of values, such as any real number between 0 and 1. As we shall see, continuous variables are useful for learning the probability of events, amongst many other uses. We next need to make an assumption about the prior probability of a candidate having each of these skills. Before seeing any test results, it is equally likely that a candidate does or doesn’t have any particular skill. Assumption 2 means that the prior probability for each skill variable should be set neutrally to 50%, which is Bernoulli(0.5). To keep our factor graph small, we will start by considering a single candidate answering the three questions of Figure 2.1. Whether the person has the C# skill or not. Whether the person has the SQL skill or not. 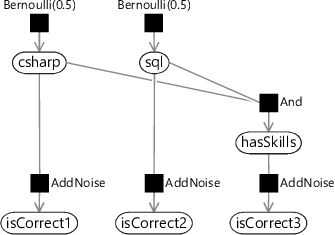 Figure 2.2Factor graph showing priors for the binary skill variables csharp and sql. Note that there is a term in the joint probability for every factor (black square) in the factor graph. If a candidate has all of the skills needed for a question then they will usually get the question right, except one time in ten they will make a mistake. If a candidate doesn’t have all the skills needed for a question, they will pick an answer at random. Because this is a multiple-choice exam with five answers, there’s a one in five chance that they get the question right. Table 2.1Conditional probability table showing the probability of each value of isCorrect1 conditioned on each of the two values of csharp. Whether the person got question 1 correct. Whether the person got question 2 correct. Figure 2.3Factor graph for the first two questions in our test. Modelling the third question is more complicated since this question requires both the csharp and sql skills. Assumption 3 and Assumption 4 refer to whether a candidate has “all the skills needed for a question”. So for question 3, we need to include a new intermediate variable to represent whether the candidate has both the csharp and sql skills. We will call this binary variable hasSkills, which we want to be true if the candidate has both skills needed for the question and false otherwise. 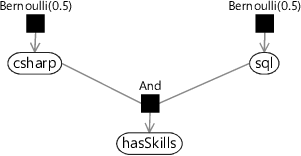 We achieve this by putting in an And factor connecting the two skill variables to the hasSkills variable. The And factor is defined so that is 1 if C is equal to and 0 otherwise. In other words, it forces the child variable C to be equal to . A factor like And, where the child has a unique value given the parents, is called a deterministic factor (see Panel 2.1). When building a model, we often want to include a variable which is a fixed function of some other variables in the model. For example, we may want a binary variable to be true if all of some other binary variables are true (AND) or if any of them are true (OR). For a continuous variable, we may want it to be the sum or product of some other continuous variables. Notice that whenever C is equal to A AND B, the conditional probability is 1 and it is 0 elsewhere. Since the overall joint probability includes this factor as one of its terms, the probability of any configuration of variables where C is not equal to A AND B must be zero. So the deterministic factor acts as a constraint that ensures C=(A AND B) is always true. Throughout this book you will see that deterministic factors play a vital role in a wide variety of models. Whether the person has both the C# and SQL skills needed for the question. Figure 2.4The And factor is a deterministic factor which constrains hasSkills to be true if csharp and sql are both true, and to be false in all other cases. The new And factor means that we now have a new And term in the joint probability distribution. Whether the person has both the C# and SQL skills needed for question 3. Whether the person got question 3 correct. Figure 2.5Factor graph for the three multiple choice questions of Figure 2.1. Because joint probability distributions like this one are big and awkward to work with, it is usually easier to use factor graphs as a more readable and manageable way to express a model. It is essential that any model contains variables corresponding to the observed data, and that these variables are of the same type. This allows the data to be attached to the model by fixing these variables to the corresponding observed data values. An inference calculation can then be used to find the marginal distributions for any other (unobserved) variable in the model. For our model, we need to ensure that we can attach our test results data to the model, which consists of a yes/no result for each question depending on whether the candidate got that question right. We can indeed attach this data to our model, because we have binary variables (isCorrect1, isCorrect2, isCorrect3) which we can set to be true if the candidate got the question right and false otherwise. There is one more assumption being made in this model that has not yet been mentioned. In fact, it is normally one of the biggest assumptions made by any model! It is the assumed scope of the model: that is, the assumption that only the variables included in the model are relevant. For example, our model makes no mention of the mental state of the candidate (tired, stressed), or of the conditions in which they were performing the test, or whether it is possible that cheating was taking place, or whether the candidate even understands the language the questions are written in. By excluding these variables from our model, we have made the strong assumption that they are independent from (do not affect) the candidate’s answers. Whether the candidate gets a question right depends only on what skills that candidate has and not on anything else. We will not explicitly call out this assumption in future models, but it is good practice to consider carefully what variables are being ignored, whenever you are designing or using a model. Having constructed the factor graph, let us pause for a moment and review the assumptions we have made so far. They are all shown together in Table 2.2. Each candidate has either mastered each skill or not. Before seeing any test results, it is equally likely that each candidate does or doesn’t have any particular skill. If a candidate has all of the skills needed for a question then they will get the question right, except one time in ten they will make a mistake. Table 2.2The five assumptions encoded in our model. It is very important to review all modelling assumptions carefully to ensure that they are reasonable. For example, Assumption 1 is a simplifying assumption which reduces the degree of skill that a candidate has into a simple yes/no variable. It is usual to have to make such simplifying assumptions, which are not exactly incorrect but which make the model less precise. Simplifying assumptions can be made as long as you keep in mind that these may reduce the accuracy of the results. Assumption 2 seems apparently safe since it is just assuming ignorance. However, it is also assuming that each of the skill variables are independent, that is, knowing that someone has one particular skill doesn’t tell you anything about whether they have any of the other skills. If some of the skills are related in some way, this may well not be the case. To keep the model simple, we will work with this assumption for now, but bear it in mind as a candidate for refinement later on. Assumption 3 and Assumption 4 are more subtle: is it really true that if the candidate has, say, two out of three skills needed for a question, then they are reduced to guesswork? We will continue to use these assumptions for now – later in the chapter we will show how to diagnose whether our model assumptions are causing problems and see how to revise them. Assumption 5, that no other variables are relevant, is reasonable assuming that there is a conscientious examiner administering the test. A good examiner will make sure that a candidate’s answers genuinely reflect their skills and are not affected by external conditions or cheating. Having reviewed our assumptions by eye, we can now try the model out to ensure that the assumptions continue to make sense when applied to realistic example data. Write down the conditional probability table for a deterministic factor which represents the OR function. The child variable C should be true if either of the parent variables A and B are true. Panel 2.1 should help. Write down all the independence and conditional independence assumptions that you can find in Figure 2.5. For each assumption ask yourself whether it is reasonable – as discussed in Chapter 1, for independence assumptions you need to ask yourself the question “does learning about A tell me anything about B?” and for conditional independence assumptions you need to ask “if I know X, does learning about A tell me anything about B?”. As mentioned above, there may be many other variables that affect the test outcomes (e.g. cheating, candidate’s state of mind). Draw a Bayesian network that includes one or more of these additional variables, as well as all the variables in our current model. Your Bayes net should only include edges between variables that directly affect each other. It may be helpful to introduce intermediate variables as well. If possible, present your Bayes net to someone else and discuss whether they agree with the assumptions you have made. discrete variablesVariables which can take one of a fixed set of values. For example, a binary variable can take only two values true or false. continuous variablesVariables which can take any value in a continuous range of values, for example, any real number between 0 and 1.
deterministic factorA factor defining a conditional probability which is always either 0 or 1. This means that the value of child variable can always be uniquely determined (i.e. computed) given the value of the parent variables. For example a factor representing the AND operation is a deterministic factor. See Panel 2.1 for more details.